When people are new to the ketogenic diet, they often wonder what type of foods they should and could eat while making the changes they need to make. While I do have a food list for people on keto, it doesn’t cover everything and definitely doesn’t cover recipes or common foods people are always asking for. 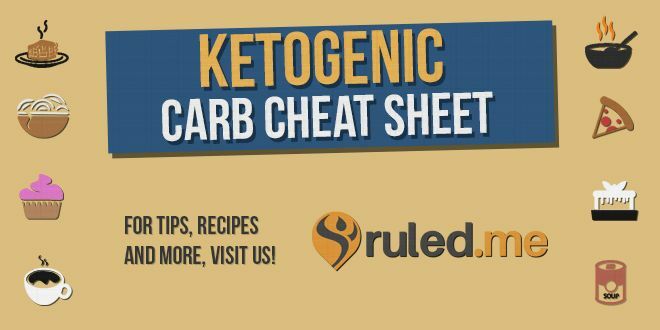 Use the list below to get an idea of what replacements you can use on the ketogenic diet and what type of foods you could replicate while going the low-carb route. Not only does this make the diet or way of eating viable for long term use, but it makes it feasible for enjoyment, too! Scroll down to the bottom to get explanations on each section and recipes for each section. Pin, share, and tweet this to help out all of your friends doing keto and to spread the word about keto! For a typical yogurt replacement, you can sub in full fat Greek yogurt, full fat cottage cheese, sour cream, or you can even make your own coconut milk yogurt. Get creative and add toasted nuts, a small amount of fresh berries (raspberries and blackberries are lowest carb), or your favorite spices. Instead of making your own cereal, you can always have a low-carb alternative. Try out chia seed pudding, flax granola sprinkled into coconut or almond milk, salted caramel pork rind cereal, or just assorted toasted nuts that are crushed and crispy. It’s quite easy to find a crunchy alternative to cereal (or just a replacement in general) so keep your eyes out and experiment for yourself to see which you like best. Oatmeal is something we all miss when it starts to get cold outside. You can easily make your own oatmeal by following one of the many recipes online. Or, if you’d like a special twist on oatmeal, give my Cinnamon Roll Oatmeal a try. Using what you might think are strange ingredients (cue cauliflower), you get an absolutely delicious faux oatmeal. Easily make yourself some delicious, fluffy pancakes. You can do this through many different methods and using many different ingredients. My favorite though, is the Faux “Buckwheat” Pancakes that are made with almond flour and flaxseed meal. An absolutely delicious and fluffy combination that tastes just like the real thing. Want a waffle? No problem – one of my favorites is this Cinnamon Roll Waffle. Two perfectly crisp, fall flavored waffles with a bright and creamy “icing” tucked in the middle. Definitely a hit for the kids! Since on a ketogenic diet you have to keep your fat intake high, you want to be consuming whole eggs rather than egg whites. Protein consumption needs to be kept to a moderate amount, so making sure you aren’t eating pure protein normally helps with this. Plus, all of the flavor comes from the yolk! You can still get a super crisp crust on chicken while keeping it moist and juicy on the inside. There’s a few ways to do this, but the best method I’ve found is by grinding up pork rinds in the food processor and adding parmesan cheese to the mix. This will result in a fantastic crust all the way around your chicken, giving you perfect fried chicken. If you don’t feel like grinding up pork rinds, you can also use the skin on your chicken thighs as a crispy element in your chicken. Check out the Oven “Grilled” Asian Chicken that I did! Stop eating foods from a can that are packed full of chemicals and carbs. Start making soups yourself, in bulk, and have a meal for anytime you want. Soup freezes wonderfully and can be re-heated and eaten quickly. One of my favorite soups to make is this Enchilada Chicken Soup. But, if you’re more of a seasonal eater, take a look at this low-carb Pumpkin Soup! Chinese takeout was my kryptonite previously to going keto. It’s my all-time favorite food to be honest, but I’ve experimented and made some great low-carb renditions of this delicious sweet and sticky food. My two favorites definitely come out to be my Mock General Tso’s (featured in Keto-fied!) and Mock Sweet and Sour Chicken. I even updated the sweet and sour chicken recipe so that it takes less time and comes out to be even crispier than before! You probably wouldn’t believe me if I told you that you can make fried rice with cauliflower, but you surely can. I will admit that it’s not exactly the same as the real thing, but it certainly gets the job done and fills that hole in your stomach that you were just itching to fill. Give it a bit of soy sauce, bacon, egg, and a couple of vegetables thrown in there and you have yourself an extremely low-carb version of fried rice. Perfect to serve up with those Chinese takeout replicas. Not only can you make rice with cauliflower, you can also make faux mashed potatoes. They’re super light and fluffy, can be mixed in with cheese, and hold up their own against the real thing. And guess what? You can even make low-carb shepherd’s pie with it, too! Instead of cracking out that crusted rye bread to make a sandwich with, take the initiative to switch over to something that’s a better option. From cabbage rolls to lettuce wraps, making wraps will be a simple process that you won’t have to worry about. If you’re looking for a more realistic wrap, you can even try your hand at a flaxseed wrap or even a psyllium husk wrap. Both are fantastic alternatives to the store-bought low-carb wraps and both won’t include any gluten! Give yourself something sweet that’s still packed full of delicious and healthy fats. Fat bombs get their name because they’re filled with fats – a delicious way to get those fats up in your diet, and enjoy doing it instead of just eating oil off of the spoon. Try to replace all soda and juice consumption with something that has no sugar or little sugar inside. Switch out fruit juices for smoothies and tea. Tea comes in a variety of flavors that can help you get through the day if you get tired of water. There’s a variety of different smoothies you can make for a meal replacement or just as a snack. Water should be your go-to replacement for soda, and I don’t recommend drinking diet soda as it can bring back cravings for sweets. Stick to drinking at least 3 litres of water a day, but try to aim for a full gallon a day. Instead of adding sugar to your coffee, you can put a few drops of stevia in there to really sweeten it up. Stevia is a great sweetener and won’t increase your blood sugar levels – so it’s a perfect way to sweeten your morning coffee. Missing your lattes and frappes? That’s not a problem! Ketoproof coffee (or better known as bulletproof coffee) is a fantastic mix of coconut oil and butter in your coffee instead of the generic cream or milk. You might think that it sounds disgusting at first, but if you think about what butter is made out of – it’s pretty much just hardened cream. Once you melt it down and mix it all up using an immersion blender, you get a delicious coating of froth on the top of your mug o’ joe. Instead of getting sugar filled cocktails, make a change to go after a low-carb alternative. Liquor is the best choice, being the lowest in carbs (most are 0 carbs, in fact). Dry wines are the second best choice, being 3-5g carbs per glass. Make sure you keep an eye on flavored liquors or mixed liquors as they may have carbs. For wines, it’s best to stick with classic red and white dry wines. Although I do suggest cutting out diet soda completely, you can make an exception to this rule for when you’re drinking. This shouldn’t be done on a regular basis, but is a much better substitute than using full sugar soda or a fruit juice as a mixer. Be very careful with even reduced calorie mixers as often times they’ll be packed full of sugars. Ice cream can be made on a ketogenic diet, normally using eggs, cream, and some type of sweetener as the base of the custard. But if you want an “easy” version of an ice cream, you can easily use avocado. Avocado has a fantastic creamy texture that’s easily hidden or can even be accented to make your own delicious sorbet! Besides cakes, brownies definitely come second on that list of delicious treats that we want once we turn to a ketogenic diet. You can easily make replacement brownies that you enjoy and feel no cravings for more afterward. Besides using almond flour and other mixtures of flours, you can actually make them out of avocado! To this day, my childhood cravings for pudding come back with a vengeance. To combat this, we can make some awesome pudding at home from different things. From avocado pudding to whipped cream pudding, there’s tons of ways you can replicate this delicious substance. Even if you don’t want to go that route, you can even make pudding our of cottage or ricotta cheese. Flavor it up with extracts and sweeteners and you’ll never know the difference. Recently I did experimentation with a new pie crust and found an absolutely delicious crust using both almond flour and psyllium husk. You can check that out on my Keto Pie Crust recipe. If you’re a sucker for custard or crème brulee, then you’ll definitely love pots de crème. Originally made in France, these super rich custards will be the perfect set piece for a dessert. Impress your friends (even the non-ketogenic ones) and serve them something they’re sure to love! They do take a bit of work and can be a bit finicky while cooking, but the end result is a perfectly delicious warm custard that is packed full of flavor. Although almond flour doesn’t get the same texture and rising ability as normal all-purpose flour, it’s a much healthier option and filled with delicious fats that can help us reach our nutrient goals for the day. Almond flour works extremely way as a replacement for all-purpose flour, giving us cakey textures and by using eggs we can achieve the rising we’re looking for. Chewiness is definitely something we look for when we make dense cakes, breads, or mostly anything that’s a low-carb version of the real thing. As mentioned for the fried chicken, you can definitely use ground up pork rinds to get a breadcrumb type of effect. Grinding pork rinds in the food processor is definitely the preferred method here, as they get to a finer consistency and will crunch up well. If you’d like an example of a breadcrumb crust that I’ve used before, check out my Keto Brussels Sprouts Au Gratin. Here, the pork rind crust crisps up and gives you a great change in texture as you’re eating. Some of the studies over the last 20 years have shown us that margarine and vegetable oils are just plain bad for our health. But saturated fats like butter and coconut oil are actually beneficial and on a ketogenic diet can help reduce cholesterol and blood pressure. These fats are an absolute treat and can be used exactly the same way margarine or vegetable oil would be used. Sugar is definitely something we aim to get rid of on a ketogenic diet, but we do need those sweet treats every once in a while, so here’s a replacement. While erythritol does have sugar alcohols, they are not processed in the body – erythritol does not pass the blood barrier in the intestine during digestion and it passes through us mostly through urine. Neither of the two effect blood sugars, and both have a glycemic index of 0. Not to mention, both are a natural sweetener. The normal store-bought chocolate bars will be loaded with added sugar to give them a consumerist’s taste. Since we’re trying to avoid sugars, we really want to make sure that we avoid these, too. There are a number of alternatives you can use – my two favorites are Baker’s chocolate and dark chocolate. With Baker’s chocolate, you’ll have to add a bit of extra sweetener to really take away from the bitterness of the Baker’s chocolate. With dark chocolate, you want to aim for a high cocoa percentage. I normally try to get anything above 86%. Additionally, there are some low-carb chocolate alternatives you can buy in the store or online, but they run a pretty penny and don’t think it’s worth it in the long run. We can’t forget about cocoa powder either. You want to go after the dark and unsweetened types where you can control the amount of sweetness the chocolate has (and control what type of sugar sub is going in). Cocoa powder is great for baked goods that you want to have an overall chocolate taste to – cakes, cookies, or even puddings. If you’re going with a higher quality (Dutch style) cocoa powder, make sure to keep in mind its strength. You won’t need to use as much as the typical recipe calls for, as it’s normally much stronger in taste. You can even make smoothies using fruit extracts. For example this tropical smoothie will taste just like you used fresh fruit juice to make, but you can keep it a secret that you didn’t. Xanthan gum is a very well-known thickener that’s gaining popularity in cooking techniques such as molecular gastronomy. It’s definitely not unknown in the world of ketogenic diets, either. Xanthan gum can be used to thicken just about anything. From an ice cream custard base, to your morning smoothie, and even to sauces, to get a thick and sticky consistency. Just be careful when adding xanthan gum because a little goes a long way. To thicken sauces no more than 1/2 tsp. should be used (and that’s for a good amount of sauce). If you add too much, it will turn into a jelly type of consistency, which can be quite unpleasant. Looking at that onion and deciding whether 14g of carbs is just too much for a single recipe? Fear no more – use the dried spice! Replacing higher carb vegetables like fennel, celery, and onion (not to mention a myriad of other vegetables) with their dried counter-parts will be packed full of flavor and only require a small amount to bring a powerhouse of flavor to your dish.